Please note: Pictures of the food pantry donations are available upon request or can be downloaded from the SpartanNash Facebook page. 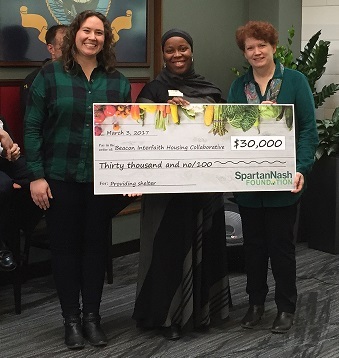 EDINA, Minn. – The SpartanNash Foundation today presented a quartet of $30,000 grants to its community nonprofit partners – Catholic Charities of St. Paul and Minneapolis, Sojourner Project, The Bridge for Youth and Beacon Interfaith Housing Collaborative. The donations – which took place at SpartanNash’s Minneapolis Service Center, located at 7600 France Ave. S in Edina – will help advance each organization’s mission. F or more than 10 years, the SpartanNash Foundation – and its predecessor the NFC Foundation – has presented grants to Catholic Charities, which serves those in need of food and shelter and advocates for justice in the community. The $30,000 grant will support the Higher Ground Facility as it provides a safe, hospitable environment and transition resources for individuals who are homeless or living in poverty. The Higher Ground Facility prepares and serves more than 900 meals per day and offers access to overnight shelter, veterans’ services, showers, laundry, health care, employment and housing services. With today’s grant, the SpartanNash Foundation has provided Catholic Charities with $140,500. The SpartanNash Foundation has awarded grants to Sojourner Project since 2010, totaling $170,000. The nonprofit, based out of Hopkins, provides emergency shelter, support and legal advocacy services to those victimized by domestic violence and other forms interpersonal violence. Sojourner provided emergency shelter to 317 women and children in 2016. The Bridge for Youth – which increases the safety, well-being and self-sufficiency of youth in crisis, working to help end youth homelessness and restore families after trauma – has also been a SpartanNash Foundation grant recipient since 2010. This year’s $30,000 donation will support around-the-clock services including crisis intervention, safe shelter, supportive housing, counseling and case management for runaway, abandoned or homeless youth. More than 800 youth will be served through The Bridge for Youth, with 85 percent exiting to safe living situations. 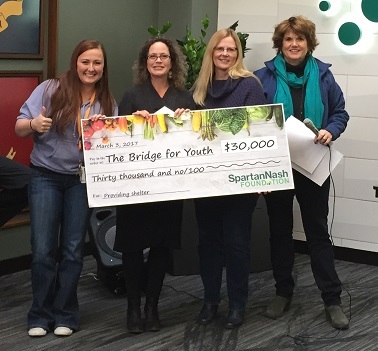 Since 2010, the SpartanNash Foundation has donated $205,000 to Bridge for Youth. Since 2013, the SpartanNash Foundation has also supported Beacon Interfaith Housing Collaborative and its Families Moving Forward program with donations totaling 190,500. In collaboration with more than 70 local congregations, Families Moving Forward provides emergency shelter, supportive housing, and individualized strengths-based services to families with children who are experiencing homelessness. Last year, Families Moving Forward assisted 68 families on their journey home — including 173 children and 103 adults. “We are proud to support our nonprofit partners through the SpartanNash Foundation, because they provide food, shelter and emergency services to those who need them most,” said Mahoney, who also serves as a member of the Foundation’s Board of Trutees. “The success of our company is built upon being good neighbors and partners in the communities we serve, and today’s donations continue to strengthen our longstanding relationship with Catholic Charities, Sojourner Project, The Bridge for Youth and Beacon Interfaith Housing Collaborative.